We finally made it! Eclifox is now an Alphaworks technology. 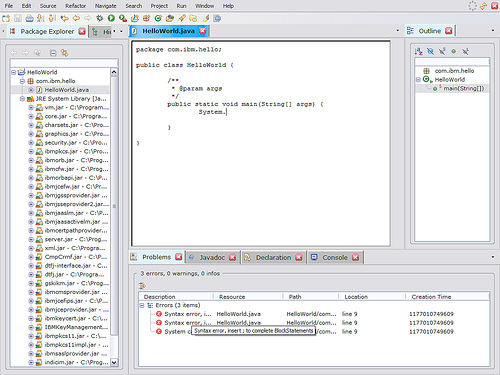 If you think that this is the screenshot of the Eclipse IDE, you are only partially right. Look again. It is Eclipse running in the Firefox browser! Here is a flash demo of Eclifox. (Run it in full-screen). 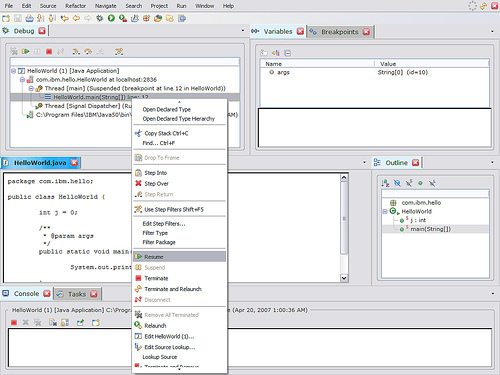 The demo shows the usage of Python and Ruby plugins from Eclifox. About a year and a half back I came up with a thought. How would it be if we were able to provide web based access to Eclipse functionality? Initially it was not clear how we could achieve this, but the idea seemed promising. So we thought we would give it a try by giving this of to a bunch of interns. In came a group of 6 students who not only had the passion to complete this, but also the zeal to learn the technology required to make it work. The above interns from SJCE put their heart and soul to this effort and developed the whole thing in less than 4 months time. Personally, I enjoyed the 6 months time I spent on guiding these students. We have a stunned a lot of people within IBM with this idea. No one expected an internship project to get so much praise (or even criticism!). Thanks to Kiran who provided guidance throughout the course of this project. Also for spending umpteen hours in getting this on alphaWorks! Also thanks to several people who provided the support when it was required. So try it out and let us know what you feel!